Sakai Community DocumentationSakai 12 Administrator Guide (English) PA SystemHow do I create a popup system message? 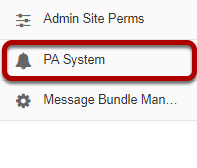 Select the PA System tool from the Tool Menu in the Administration Workspace. Zoom: Enter the popup information. Description: This is the description of your popup message as shown in the PA System message list. Start Time: This is the time and date when your popup will be visible to users. End Time: This is the time and date when you popup will no longer be available to users. Distribution: You may choose to Show this campaign to everyone or Show this campaign to selected users. If you choose selected users, you may enter the comma separated userids for selected users in the text field below. Click Save Popup to save your changes. Zoom: View the popup message. When active, the popup message will display to users as shown in the image above. 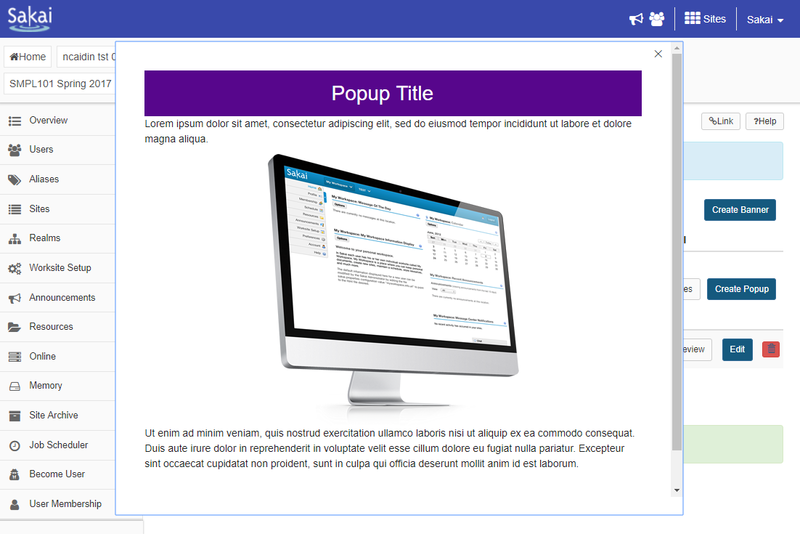 Admin users may also click the Preview button to preview a popup message. Zoom: Admin users may also click the Preview button to preview a popup message. Prev: How do I delete a banner system message? Next: How do I edit an existing popup system message?